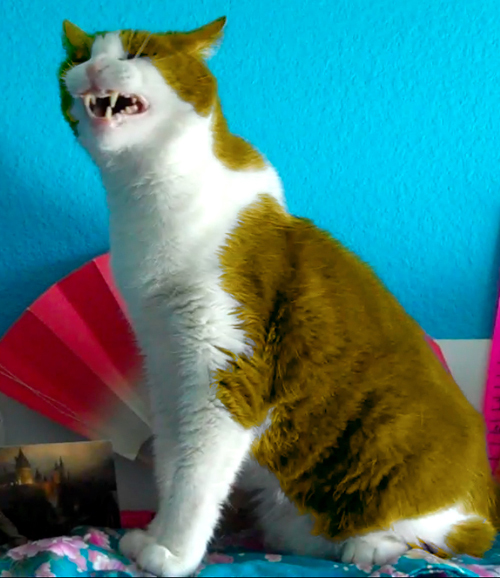 Anyway, ONWARD TO THE REACTIONS! First of all, love the way they have been going about all their promos, one sheets, etc. for the movie. Releasing these posters only solidified that they're theme/design for their marketing is classy and simple. 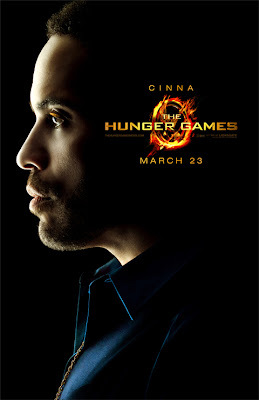 Yay: Katniss' poster is the only one facing the opposite direction. Fan artists, go nuts by pairing Katniss with your choice of romantic interest! Also, she most definitely looks 16 here. The Hunger Games treatment is slightly.....awkward. The only problem really is the movie title itself, which is slowly making it's way into the character photo. I expect more out of the Hunger Games marketing team. This should have been addressed before approval. 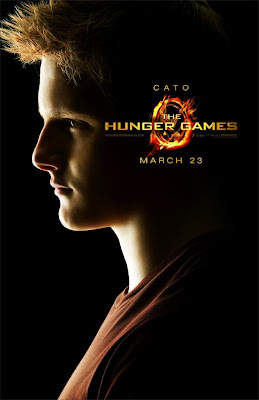 Yay: ASDFLASKDFALSDF PEETA! Hair. Eyebrows. 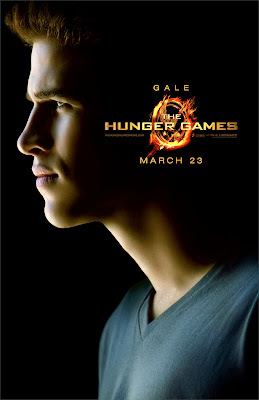 Yay: Gale looks awesome. Not much to say here, Liam doesn't need to do much. Nay: We all know that posters like these are airbrushed and retouched. That's cool, it's kind of the way things are when it comes to movie posters. However, Gale's is the only one that is EXTREMELY noticeable. Just a little too blur happy. 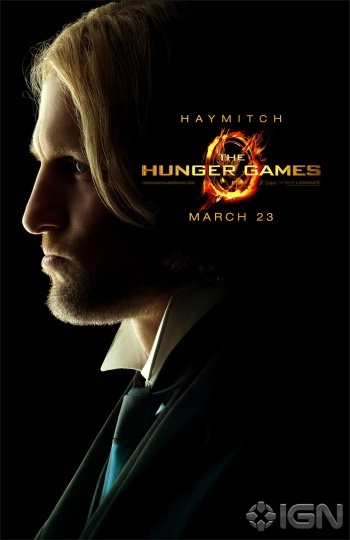 Yay: Haymitch looks pretty snazzy here! Definitely in his capitol clothes. It's kind of amusing because any outsider who stumbles upon this poster not familiar with the story has no idea what it means to be Haymitch. Nay: Um, hair? What's going on here? I guess we will just have to see! Yay: PERFECTION. Gold eyeliner. This man is Cinna and I cannot wait to see him play this character. Yay: I had my doubts awhile ago about Elizabeth Banks, but I'm sold now. She looks perfect. The way the light falls on her in this poster illustrates everything that is....EFFIE! Yay: :'( ::sniff:: I.......I...... ::falls to knees:: RUUUUUUUUUUUUE!!!!!! Yay: I think Cato looks pretty cool here. I like the idea that he's not super evil looking, just....confident. He knows he's got it in the bag and I think that shows on his face in this poster. That's all folks! Those are my thoughts! Now, don't forget to tune in tonight 10 ET/ 7 PT for a very special episode of the HGFiresideChat. They will be talking about the posters! Unfortunately I'll be working so I won't be able to live tweet with you all. Enjoy the podcast for me! Congratulations to Down With The Capitol on being The Hunger Games Fan of the Week! Click HERE for the interview!! What's this? 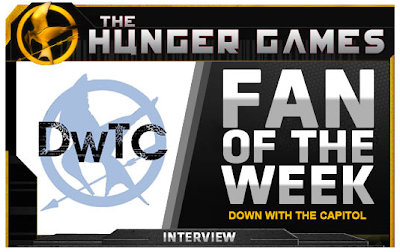 Our absolute favorite fan site, Down With The Capitol, is the OFFICIAL Hunger Games Fan of the Week! CONGRATULATIONS you guys, you totally deserve it!!! DANCE PARTY!! 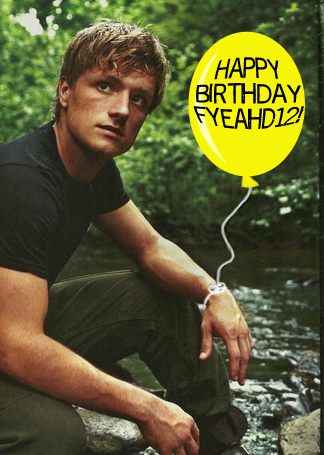 Now go celebrate by getting your Haymitch on. TONIGHT! 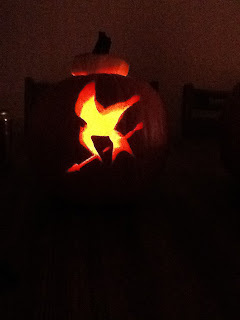 HG Fireside Chat Episode 30.5 "POSTER PALOOZA"
Click here to listen LIVE tonight (10/28/11) at 10pm ET/7pm PT! Episode 30.5 of Hunger Games Fireside Chat will air live on Friday, October 28, at 10pm ET/7pm PT! Join us as we discuss, analyze, contemplate, and gush about the official character posters that were released on Thursday, October 27, 2011. This extra special edition of Fireside Chat will be 30 minutes long and feature representatives from Down with the Capitol and The Hob. 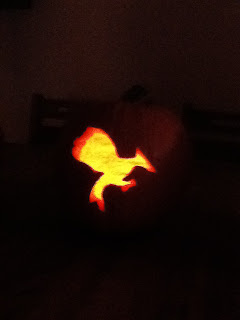 We’ll also be joined by Crystal of Mockingjay.net and FictionalFood.net. 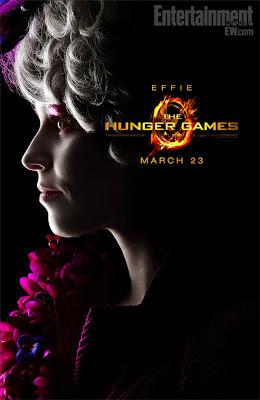 What do we think about Effie’s garish look? How do we feel about Haymitch’s long blond hair? Listen tonight and find out! We’d love to hear what you think about the posters as well, so feel free to comment here with your thoughts! You can chat with other listeners throughout the live show by using our hashtag #HGFiresideChat on Twitter! We recommend TweetChat to easily follow along with the conversation. 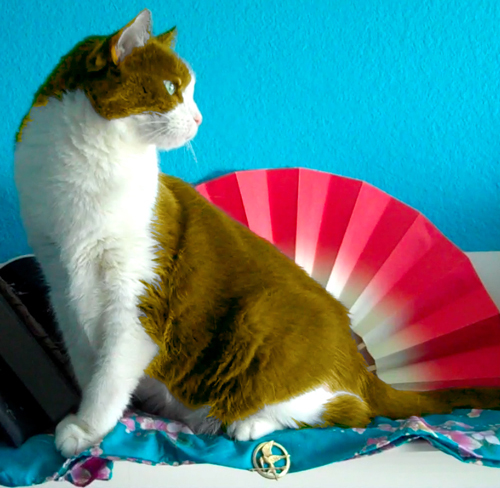 Raindrop's photoshoot: suprisingly, a success. As you may have heard, the totally awesome Victor's Village is hosting a Buttercup contest. Most likely the best idea ever. I thought this might be the only opportune time where I can legitimately post about my own Buttercup: Raindrop. I got Raindrop in 1998, given to me by my parents from the next door neighbor's of my then best friend. I would find out later that Raindrop was raised in a not so loving situation. His mom, brothers and sisters were held in a confined area, only to be tormented by loud barking dogs quite closely to their living space. Raindrop wasn't very well taken care of either, since he had a few health problems that needed to be dealt with when he came into our home. My parents lovingly dubbed him "Dumpster Kitty". We named him Raindrop due to his white markings on his face, and well, I don't know if you'd call him a people cat. When he was a kitten he would sit on my mom's lap despite all the pins and needles sticking out of the quilt she'd been working on. This eventually stopped when he got older. 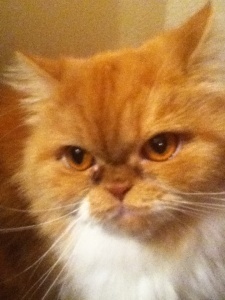 For the most part he would prowl around the house, doing as he pleased. He's incredibly independent as you can leave him for days on end (granted you leave him enough food and water) and he'll be just fine when you return. He does not seek yours, mine, or anyone else's favor. My aunt calls him "The Cougar". It was the first day of Summer (I believe it was around junior high) and I was watching morning cartoons sitting on the couch. Lo and behold Raindrop jumped on the couch and curled up in my lap. This was huge! He stayed there for about five minutes and then got up and hopped off the couch. Little did I know that would be the first and only time Raindrop sat in my lap entirely of his own accord. Nowadays, Raindrop allows me to pet him much more. Maybe it's his old age, I don't know. I've spent 13 years trying to figure this cat out, trying to find a chink in his armor that will allow me to hold him or have him in my lap more than half a minute. No such luck. At least he has improved his people skills. He'll let you pet him. Go ahead, I encourage it! He does enjoy it. 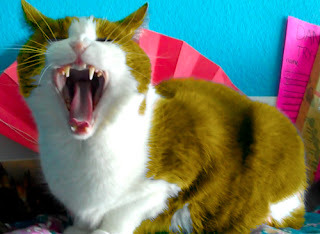 But pet at your own risk because one minute he'll be happy as a clam and next minute your fingers are in his jaws. Reading the Hunger Games makes me think that if we were living in Panem, Raindrop would no doubt have to be an outdoor cat. If I lived in District 12, I'd put money on if Buttercup and Raindrop were to meet face to face they would either A. engage in a fight to the death or B. get along extremely well and become hunting buddies. So onto the task at hand: The Buttercup Contest. I really feel Raindrop is a true contender. He certainly channels Buttercup most of the time, and I feel the only time Raindrop shows even some kind of affection for me it's during feeding time. "This is the closest we will ever come to love". So please, dear readers, I ask you to vote for Raindrop. 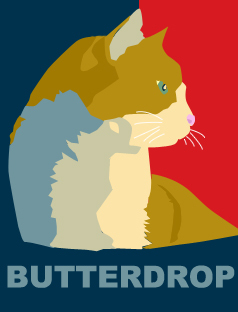 Or as I like to call him, "Butterdrop". Hold on to your britches, cause here comes THE OFFICIAL CHARACTER POSTERS! Guess what! Lionsgate gave Down With The Capitol full res versions! You can find high res versions here! What do you guys think? Certainly a big, big day for Hunger Games fans! This evening @Twiffidy, @saidthejoker and I commenced on the inevitable task of carving Hunger Games themed pumpkins, thanks to the awesome stencils provided by Hunger Games DWTC. Tell us what you think! "Absolutely it [stays true]. Blue hair. Very bizarre," the actor said while promoting his upcoming drama about the mortgage crisis "Margin Call." Earlier this year, Tucci was in England shooting "Jack the Giant Killer" when he began to map out his Flickerman look. "We had wigs made there," he said. "I had some noses made, which we ended up not using and teeth and a whole bunch of different things. When I got to North Carolina [to shoot 'Hunger Games'], we played around for about seven hours and we started shooting the next day. I was only there for about a week, but it was fantastic." 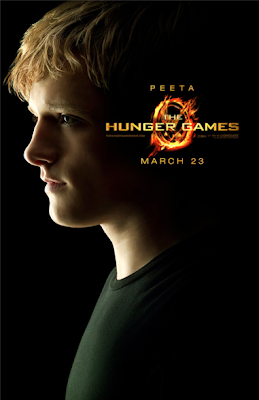 One of the scenes he shot was the pre-Games interviews with Lawrence's Katniss and Josh Hutcherson's Peeta Mellark, who confesses his love for Katniss during the chat. Both Lawrence and Hutcherson, Tucci said, pulled off the pivotal scene with an aplomb that defied their years. "She was amazing," he said. "They were all amazing. She's just so good and so mature at such a young age. It was really fun. Really fun. And Gary, he's great." One year ago, I was tired of not being able to talk to any of my friends about the Hunger Games. I had read the trilogy a month previously thanks to my mother's suggestion and her Kindle, and felt like I was about to burst. I had to talk to someone about it that wasn't my mom (sorry Mom, you know I love you!). Meanwhile, Tiffany (my long time friend and admin) would say things like "I know! It's on my Kindle, let me just get through this Harry Potter reread and then I'll get to it!" every time I poked her about it. 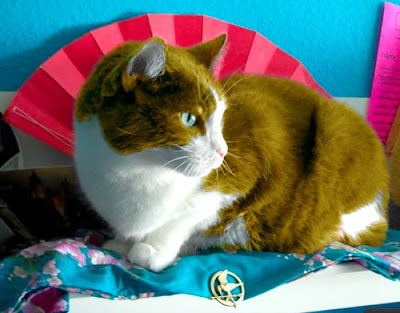 I nagged her about it every time I saw her like any other Hunger Games fan would. So at this point I knew Tiffany would not be long, but too long for me to wait around. I was in danger of bursting at the Seams (see what I did there?) if I didn't get into a Hunger Games discussion with someone. I had recently found the wonder of the display of the human condition and culture that is TUMBLR. So I thought, "What the hell"? 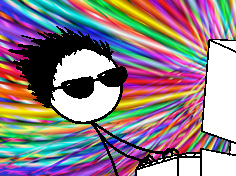 F***YeahDistrict12 was born. Definitely one of the best decisions I've made. Ever since I have started my online Hunger Games journey, it has made me extremely satisfied and happy to connect with so many other people who share this same love of this incredible story. Before I knew it, someone known as the "Gamemakers Anon" was sending me messages about something about "Panem October", and WABAM! next thing I know I'm listening to the BEST PODCAST EVER, The HG Fireside Chat. This of course, led me to practically live on Twitter and chat with other Hunger Games people who I would definitely call my friends. I have come to care and love these people. We collaborate, talk about random things, and support each other's blogs. It's a fantastic community, and am very honored to be a part of it. TheCapitol.pn District 4 D.I.P.s Have Been Released! 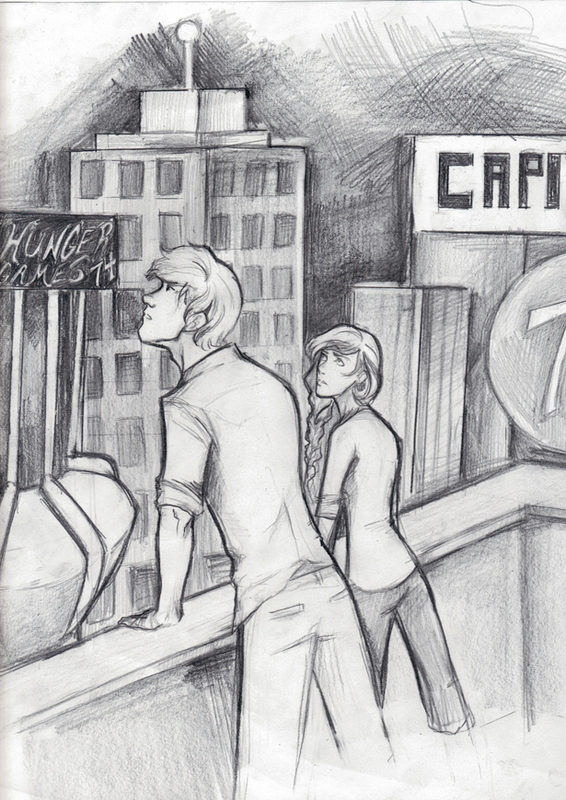 I haven't posted much about TheCapitol.pn, but to be honest it really didn't seem like I needed to. Hunger Games fans are flocking to TheCapitol.pn like crazy! 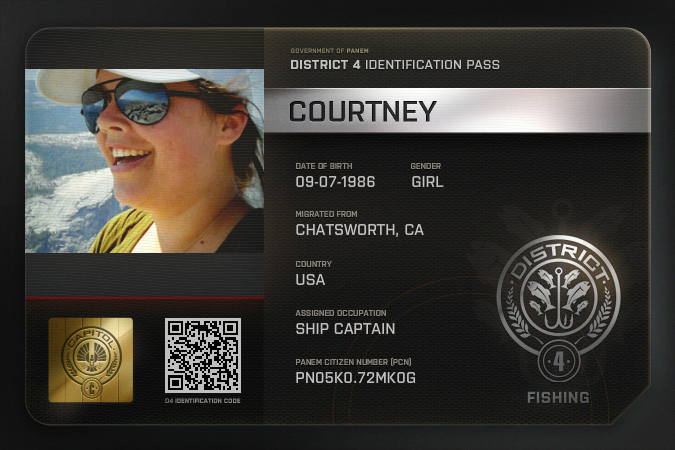 I was put in District 4 (YES, FINNICK) and was DYING to know what my occupation would be. SHIP CAPTAIN! YA HAR! So people keep expediting those DIPs, but really it's only a matter of days before everyone earns theirs, so no worries! Districts 1, 8, 10, and 11 are the only ones left, so the longest you'll have to wait for your district is about 4 days. Looks like District 11 may get theirs tomorrow! I'm really interested to see all the district seals, BUT MORE IMPORTANTLY: WHAT HAPPENS NEXT? I think that's the burning question we've all been answering ourselves ever since TheCapitol.pn came into our lives. Thus began a frenzy to find out what district you were in. What did it mean? Would we be reaped? Soon after we were all signed up, more people found out via source page another site: welcometopanem.com. In May, we could go to a Mellark Bakery site and order bread. Curiosity buzzed around the fan community, and more and more people every day signed up for tesserae, all wondering what might hold for us in October. Meanwhile on Tumblr, people by the hundreds started following our blog simply for the name. 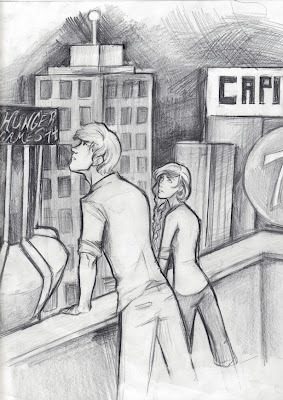 I started F****YeahDistrict12 as only a Hunger Games blog, but oddly enough those who got put in District 12 on Panem October started reporting for duty. Having all these followers land in my lap, I started fighting back, rallying other people to stand up against those known as "GamemakersAnon". This sparked a war of rallying on our side, secret poems and threatening message on their side. It was a thrilling, mysterious experience. Oh, how the Gamemakers have changed. Or have they? Just because they aren't leaving us threatening messages, doesn't mean they've given up on us. They are still watching us. Still, we find @panemgovernment leaving us threatening tweets (as that's where I spend most of my time nowadays. Rowan has even "graced" us with his presence on the HG Fireside Chat (which is on tonight, don't miss it!). 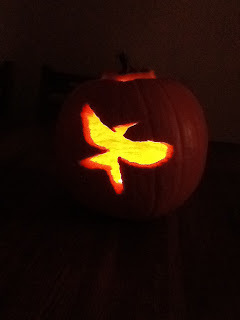 Panem October is reaching more and more Hunger Games fans every day. 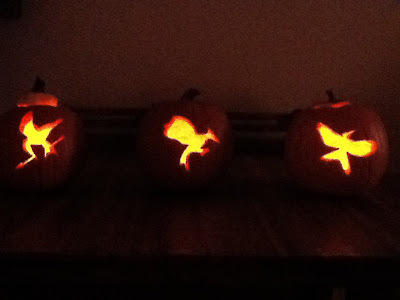 Finally, October is here and we have gotten the first glimpse of the Panem October experience. It's very impressive for a fan-made ARG. There's still so much left of it uncover, yet there's a great deal you can do: friend each other, leave a Panem-oriented Facebook-like status, Panem Radio, and keep racking up scans of your Panem ID to reveal your district's website. Even with all this, there are still new features to be readily available and more parts of the website to uncover. 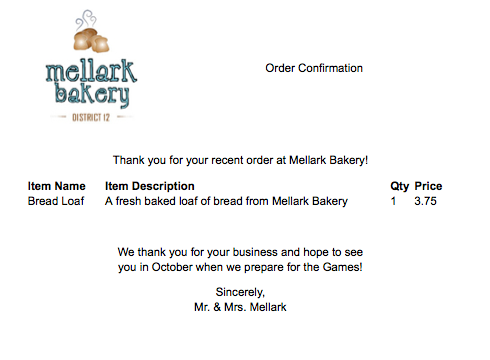 Panem October is setting an extremely high bar. 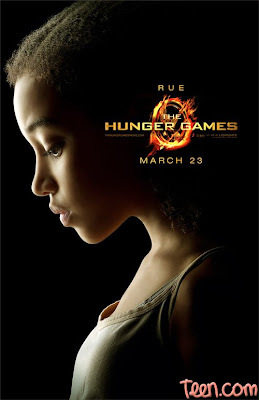 When the first official Hunger Games teaser trailer came to a close, you could hear a haunting four note whistle that could only belong to Rue. In the bottom corner of the screen: #WhatsMyDistrict. Soon after we were all directed to TheCapitol.PN, which was a whole bunch of mechanical noises and static. Little by little, day by day, the image became clearer. When the site opened, "WOW are those graphics cool!" I for one, was also extremely pleased by the official Hunger Games ARG URL. For those who don't know, other countries URLs end differently: .UK, .JP, etc. The fact that this one ends in .PN is GENIUS. GENIUS! Still, this whole thing is mysterious. Now many of us are trying to expedite our DIPs for our districts. Why? Uh, why not? I don't know about you, but I want to see what the official Hunger Games ARG has to offer. They've also enlisted one lucky twitter member per district to be a District Recruiter. My good twitter friend @JeamieMarie got chosen for District 7 recruiter, and thanks to her efforts, they've already achieved their DIPs (Come on, District 4 get a move on!). I guess we will just have to wait and see what exactly they have to offer. The fact that Lionsgate allowed these two to exist is a godsend. It really showed me that they actually do care about what fans want. 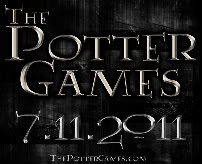 I love that not only is Panem October allowed to flourish, but Lionsgate is making efforts to keep their ARG up to par. 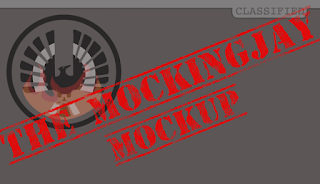 If not for PanemOctober launching, would TheCapitol.PN have started assigning recruiters as soon as they did? I'm not too sure, but it really seems that because Panem October exists, TheCapitol.PN is stepping up their game. BOTH! 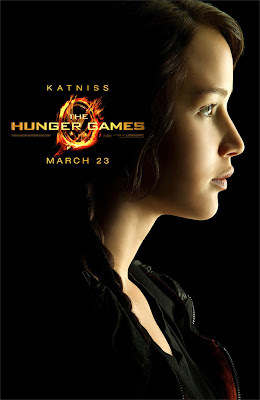 These ARGs are creating more buzz for the Hunger Games, both the movie and the books. Clearly, PO and PN can live in harmony and both have the potential to offer great fan experiences. I say two is better than one. In case you haven't heard, the BEST Hunger Games podcast around airs tonight at 10 EST/7 PST. Tonight's topic: "Battle of the ARGs"